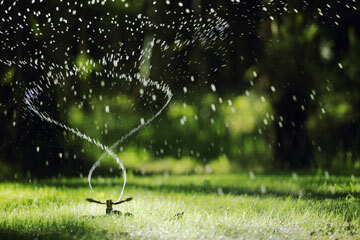 There always tends to be some confusion when it comes to when to water your Florida lawn. Sometimes it can be difficult to find a balance between under watering, over watering, and not violating water restrictions. A healthy lawn requires about 1 inch to 1.5 inches over the course of a week, but how do you know if you're hitting that mark? A great lawn care tip for Florida grass is to check it with a screwdriver. Sounds crazy, right? But if you can't stick a 6 inch screwdriver into your grass with ease, you're not watering enough! Now that you're sure your lawn in hydrated, how do you keep from over watering St Augustine grass? In the summer, it's best to irrigate 2-3 times over the course of a week, as opposed to all at once. In winter, your lawn is dormant and requires less nutrients while it's not growing. Despite the season, the best time of day to water your Florida lawn is always going to be in the morning. Watering later in the day can allow evaporation to occur before your lawn has had a chance to absorb it. Alternatively, keeping your grass too moist can accelerate disease occurrence. While deciding when to water your Florida lawn, be mindful of your county's water restrictions. Not abiding by these restrictions could result in a violation notice and a fine. However, it's simple to check on what guidelines your county has in place here. If you have any questions regarding the maintenance of your St Augustine grass in Kissimmee or its surrounding areas, don't hesitate to call Ludlow Services at (407) 456-1369.